In a similar vein to Marco Pierre White, Jamie Oliver and Gordon Ramsey – Marcus Wareing has become a TV chef personality whose equal parts loved and loathed. Over the past three years, the chef has perhaps become best known as the second toughest judge on MasterChef: The Professionals, but he’s also the name behind three London restaurants. At one end of the spectrum, Marcus at The Berkeley in Knightsbridge is the chef’s two Michelin-starred mother ship, offering one of the best fine dining experiences in London. At the other end, Tredwell’s in Seven Dials is a more casual affair, serving high-end comfort food that does not require guests to re-mortgage. The Gilbert Scott, thus, falls somewhere between the two. On the ground-floor of the Renaissance Hotel in St. Pancras Station, The Gilbert Scott focuses on a quintessentially British menu that’s served in one of London’s more attractive dining halls – providing you’re able to find it. Arriving at St. Pancras 30 minutes early, we flit around the station in search of the hotel until a tiny sign points to the hotel via a staircase on the main, piano-lined, concourse between the shops. After walking back and forth, up and down, searching relentlessly for what feels like an eternity, we’re pointed in the right direction of a door that bears no affiliation with the hotel. Here a receptionist tells us to walk to the end of the corridor and turn right, as she points to the left. After turning right and wasting some more valuable eating time swanning around the lobby, we’re finally directed downstairs, along another corridor and boom; we’ve found it. I feel like Howard Carter on discovering the tomb of Tutankhamen, only hungrier. 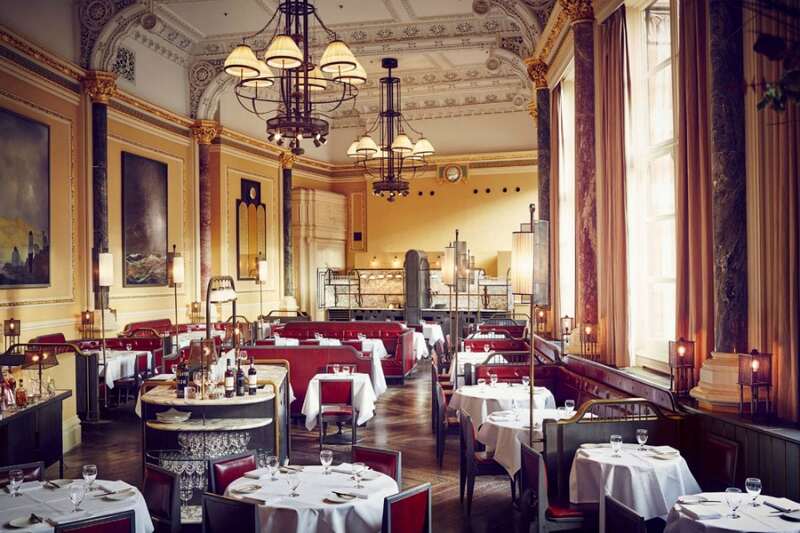 Inside, the restaurant is undeniably one of the most stunning spaces in London, alongside the likes of Berners Tavern and Savini at The Criterion. Luxurious marble columns stretch from the parquet flooring to the ridiculously high ceilings, placated by wrought iron chandeliers. On the floor, oxblood leather blanquettes are cosy but not seedy, with natural light flooding the room from the windows placed higher than seating level to give a greater sense of intimacy. As well as being illustriously decadent (romantic, even), the space also feels quintessentially British. We half expect a tall-hatted chef to stride across the floor, wheeling a polished silver trolley of over-cooked roasting joints, but – thankfully – there’s no such joy. Instead, the food is split into a range of dishes that give very little away. As is the case with Marcus Wareing’s other restaurants, dishes are described as a list of key ingredients. Having visited each of the chef’s restaurants, I’m still unable to decide whether this is unapologetically pretentious, or a way of rousing the senses and surprising diners. We wait with baited breath, unsure of exactly what to expect until the plates hit the table. Even the waitress is a little unsure when trying to explain some of the dishes. Irrespective of how the formatting may come across, the list of ingredients read like the work of a chef with an almost arcane understanding of flavours. On paper, ‘Jersey Royals, calçot, Cacklebean Farm egg, crackling, Tunworth’; or ‘pineapple, coconut, guava sorbet, lemongrass’ sound like an absolute delight. To start, terrine of pigeon, pistachio and prune is well-executed, though the cooking of the pigeon (in a water-bath) doesn’t quite coax all of the intense gamey flavour from the bird. The addition of pistachio adds texture, but minuscule flavour, while sweetness of prune works remarkably well with both the pigeon and accompanying subtly spiced pear chutney. On the other side of the table, ‘crispy pigs head’ contains three croquettes of slowly-braised head meat. These boast an insalubriously rich filling, with the breaded parcels crisp and fried without any surplus residual grease. Alone, the croquettes are the best imaginable example of comfort food available, but the bed of cheesy sauce knocks the dish’s balance. What’s more, the accompanying slices of paper-thin coppa, alone, taste sensational yet bring little to the dish as a whole. Far better is a main course of Yorkshire lamb. Initially torn between the beef short rib and the lamb, I ask the waitress for a suggestion of her favourite. She favours the beef, but insists I’ll love the lamb if I am British. She is correct – two contrasting cuts of lamb embellish the plate: boned cutlets are cooked remarkably (perfectly pink with properly-rendered fat) yet it’s the breaded tube of cheap tongue that’s, perhaps ironically, the jewel in the crown of this dish. Underneath, a bed of slow-cooked lentils adds depth as a refreshing retreat from potato, while the salsa verde is a somewhat Mediterranean take on classic mint sauce. This is the best thing we eat at The Gilbert Scott, by quite some margin. Iberico pork, on the other hand, comes with the promise of being cooked “pink”. It’s not as perfectly rare as the lamb, but the cooking is braver than so many restaurants terrified of serving under-cooked pig. Alas, the outside has been finished in a frying pan so hot that a formed crust has an astringent bitterness which overwhelms underlying notes of delicious acorn-enriched fat. This comes with an assortment of simply prepared vegetables, tossed with a generous helping of ‘Nduja: the respectable, expensive kind that packs a punch of spice, but isn’t aggressively hot. Finally, apple tarte Tatin has a huge ratio of apple-to-pastry. Usually this would be fine, but the fruit is dredged with so much sugar that a prevalent cloying sweetness is impossible to escape – thank Heavens for the accompanying rocher of pecan brittle ice cream. Additionally, the inclusion of rhubarb in the buttermilk pudding dessert brings a palate cleansing sharpness that’s a welcome relief from lemon, while thin sheets of meringue and toasted oats build upon the dish’s texture. In addition to demonstrating a flagrantly high level of skill, the menu here offers good value when considering the setting and quality of ingredients. However, much of the food shows an attempt to bridge the gap between fine dining and something a little more casual, but falls through the cracks. The well-executed dishes are simply remarkable, but the occasional lack of attention to detail elsewhere is saddening, especially considering the obviously high cooking skill of the kitchen staff. Regardless, the better dishes served do make The Gilbert Scott the best train station restaurant in London (if not the whole country). The Gilbert Scott can be found at St. Pancras Renaissance Hotel London, Euston Road, London, NW1 2AR.